When will the new video come out explaining how to use the new Quick Setup Wizzard? I am fining it very confusing. What pertains to SWTOR? What new key binding keys we need to setup? I can't alternate screens and get the new leader to have the other character follow. Expecially after an attack. While the final page of the Quick Setup Wizard has changed a little (i.e. there is no longer two tabs), what is displayed is essentially the same options. The default setup for SWTOR will still have the appropriate selection, and the SWTOR video still tells you the exact things you need to set. Where, in the video the Follow Target/Assist Target game key bindings (which are on the second tab of the final page at around https://youtu.be/VPc9pBj-47k?t=262), are now in the combined final page, on the right hand side under the heading Game Key Bindings. So I'm getting "please ensure Game Key Bindings are configured for . . . ."
So I now need to put in a "Target Party Leader" ? What would the key bindings be? Target Group Member 1 (which would have to be different for each character)? You can use the easiest follow/assist mode for you to configure. If there is no one Hotkey that you can press in SWTOR to target the group leader, then it would be easier to choose another Follow/Assist mode from the drop-down box. The style used in the original SWTOR video is the same as "Target current Slot, then Follow/Assist Target", however this does indeed require you to fill in which different key each window would press to target each of the others (this is particularly tedious for SWTOR). 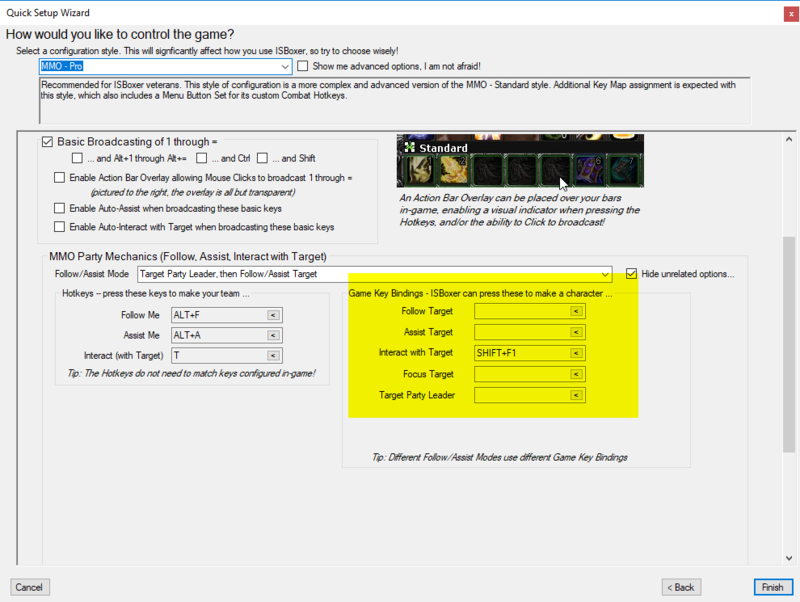 On the other hand, you may be able to find another way to use the same Hotkey in all windows, to reliably either target, follow, or assist the same character on your team, and that would allow you to configure one of the simpler Follow/Assist modes. I'm only dual boxing,with 2 companions heal/tank. So I ran through the Wizard again, only this time I reversed the order of my characters when prompted to add them. Everything is working fine now, follow & acquire target. I just don't see any use for Target Party Leader, yet the Wizard won't let me finish unless I insert a keyboard character. In the past, I would box with four, and would simply log-out all four, log back-in, and bring out all 4 companions (although it won't work for instances). But now, with the companions being so powerful, it is simpler to just dual box.